Better access by vehicle for locals and visitors. Preserve this World Heritage site. Works prevent major flooding damage. New paths created. Stabilised land to avoid further slippage into river. Technically demanding and complex analysis needed. Jackfield is located 1km downstream of Ironbridge on the south side of the River Severn in the Ironbridge Gorge, Shropshire and is part of a UNESCO designated World Heritage site. It is also the site of an historic landslip which has seriously affected residents, industry, rail and road transport since the early 1700s. There is only one road across the slip. Back in 1952 a landslip moved approximately 17m into the river causing a partial blockage and major structural damage to houses and roads. In 1982 a further smaller landslip cut off the only through road with a permanent diversion of vehicles along the higher abandoned railway track bed, itself on the move and laid over with timber boards for easier maintenance. 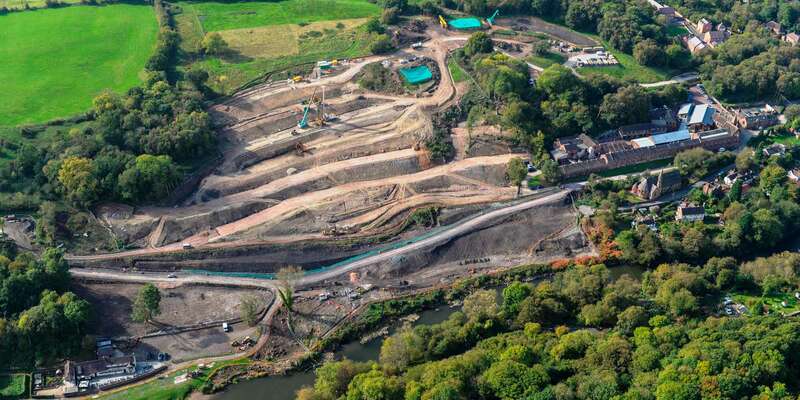 The primary objective of this technically demanding and complex project was to stabilise a 350m length of moving hillside which could cause a landslip into the river causing a blockage and upstream flooding. This has now been eliminated and the stabilisation has also allowed for improvement of transport links back into the area with a new road. The main works involved the installation of around 2,100 10m piles in 9 rows across the hillside. These were designed to penetrate just past the slip plane which exists about 7m underground and to resist against further movement. The geotechnical solution adopted by Jacobs as the principal designer uses piles installed to below the slip plane. Nine rows of closely spaced 600mm diameter piles were needed approximately 25m apart up the hillside. 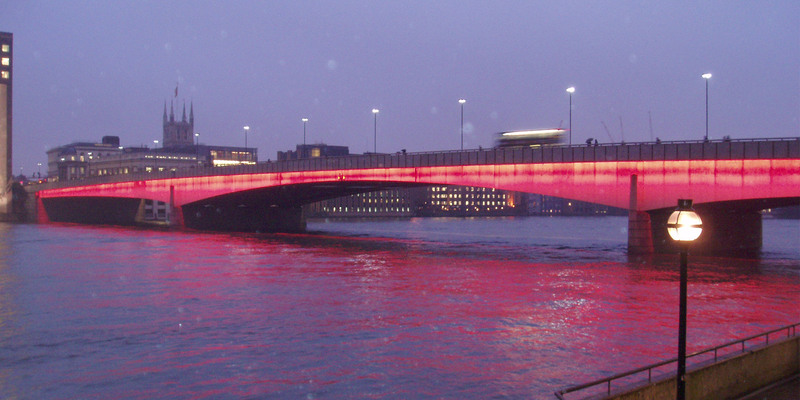 The piles were constructed by a piling rig drilling a vertical circular hole and then pumped full of wet concrete. Steel tube reinforcement was then plunged into the hole. Advance grouting works were carried out to infill any shallow mine workings that might be present. To eliminate further toe erosion at the river, the bank was excavated and revetted with large stones and a row of smaller 250mm diameter piles installed along the crest to further stabilise against local slippage. 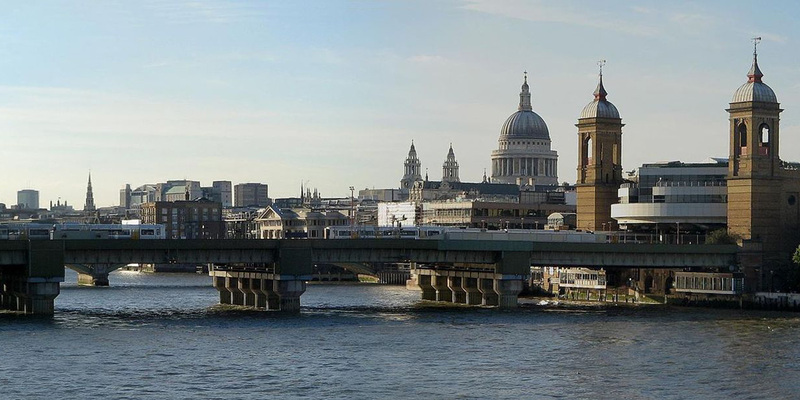 The scheme fulfils the council’s and UNESCO sustainability obligations to safeguard the fabric of the World Heritage site and mitigates against an estimated minimum £200m community flooding cost. Environmental value was achieved through geotechnical excellence both in design and construction as well as providing above ground benefits to the local community. The added value is a new stable road serving the Jackfield community, delivering easier access to homes and greater visitor attraction to the local businesses, museums and new public open spaces. Emergency vehicles such as fire engines and ambulances can now access the furthest dwellings. Additionally areas of mining spoil and clays which could have polluted the river have been successfully stabilised behind the piles. New footpaths and riverside walks were created across the newly landscaped slip area. A scenic picnic area was constructed with a colourful tiled retaining wall depicting local children’s view of the works along with an artist’s interpretation of the landslip and underlying geology. This high risk project was extremely technically challenging but every challenge was met positively and robustly to deliver the project on time, within budget and with rigorous geotechnical analysis of our methods preventing unintended landslips. 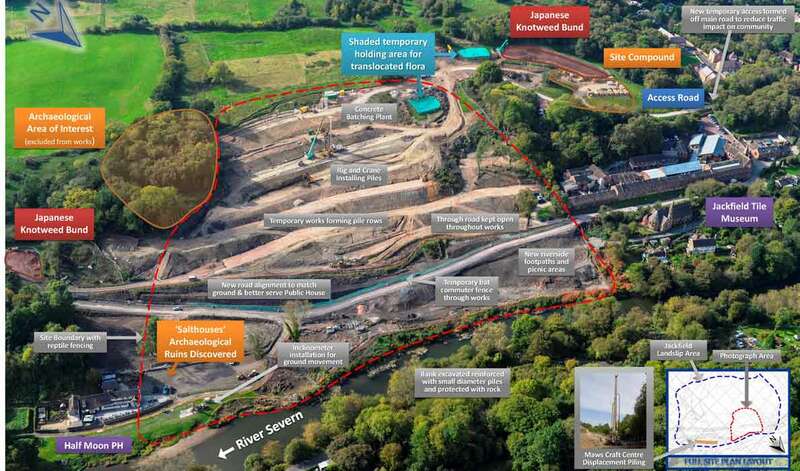 2,100 piles were installed using approximately 21km of steel tube, enough to stretch from Ironbridge to Shrewsbury. 6000m3 of wet concrete was poured into the ground to make the piles. Temporary piling platforms had to support a 100 tonne piling rig and 60 tonne service crane. There was a real risk that bigger slippages could be triggered. After the 1952 major slip academic studies were produced which the geotechnical world still regards as the classical treatise for clay slopes.